Pacemaker ( artificial pacemaker ( IVSR ) ) - is a unique medical device the size of a matchbox that is implanted directly on the heart muscle . This priborchik elektricheskie generates pulses that cause heart muscle to a normal rhythm . Usually pacemaker implantation is performed under local anesthesia. The total duration of the operation is about half an hour . IVSR sewn under the pectoral muscle or under the skin . Patient hardly feels his presence. Pacemaker runs on powerful lithium battery , which lasts for 7-14 years. After that period, they must be replaced . 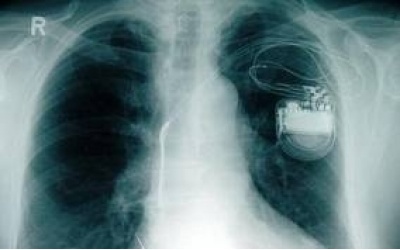 Surgery to implant an artificial cardiac pacemaker planned . Patient is assigned several types of electrocardiogram - it is necessary to determine the exact parameters of the device . In cardiology clinics in Germany are used solely tech pacemakers, which if necessary can be reprogrammed without resorting to surgery . Checking functions IVSR made ​​from outside, through the skin. Upon the expiration of the batteries feeding device , experts make their replacement . Incidentally, it was in Germany for many years are being developed in terms of creating a miniature fuel cell based on the use of biologically active liquids own person. The first prototypes of such power sources based on glucose were created in the 70s of the last century. But then in the achievement of significant progress in the technology of traditional batteries investigations in this direction have been suspended. At the present stage of Freiburg scientists again come to grips with this issue - they are trying to create a complete self-contained power supply , the key components of which are special electrodes . In one of them serving the anode is oxidized and the glucose is converted to gluconic acid with the release of electrons passing through the pacemaker , and the second electrode fall in the - cathode where oxygen is reduced to water . Its ultimate goal is the development of scientists see pacemaker , the surface of which is coated with a coating that produces energy , thus avoiding the need to implant the power supply.